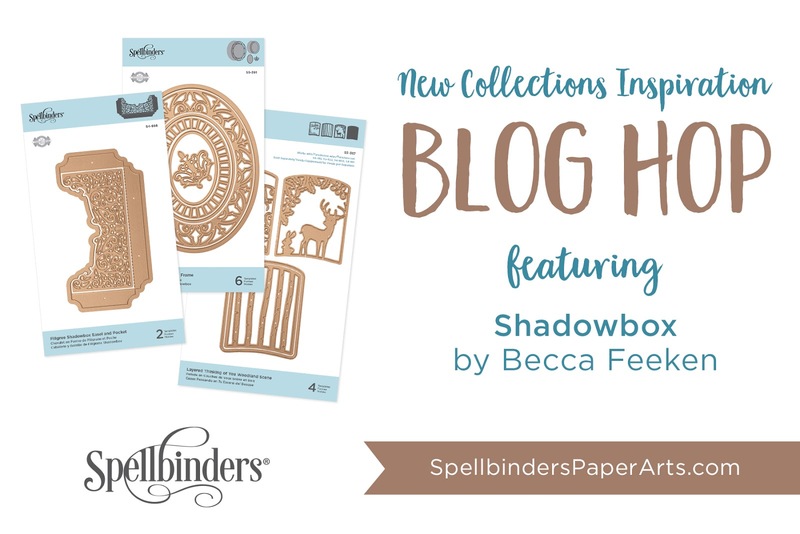 This blog hop celebrates Spellbinders -Shadowbox Collections by Becca Feeken. If you have arrived from Sandra Nagel's blog, you are in the right place. To celebrate this release, Spellbinders is giving away a $50 gift certificate to 3 lucky blog readers – selected from the comments across all of the blogs in the hop. Giveaway closes on Sunday, February 10th 11:59 pm EDT. Winners will be announced in our blog hop post the following Monday. Winner is responsible for shipping cost, duties and taxes. 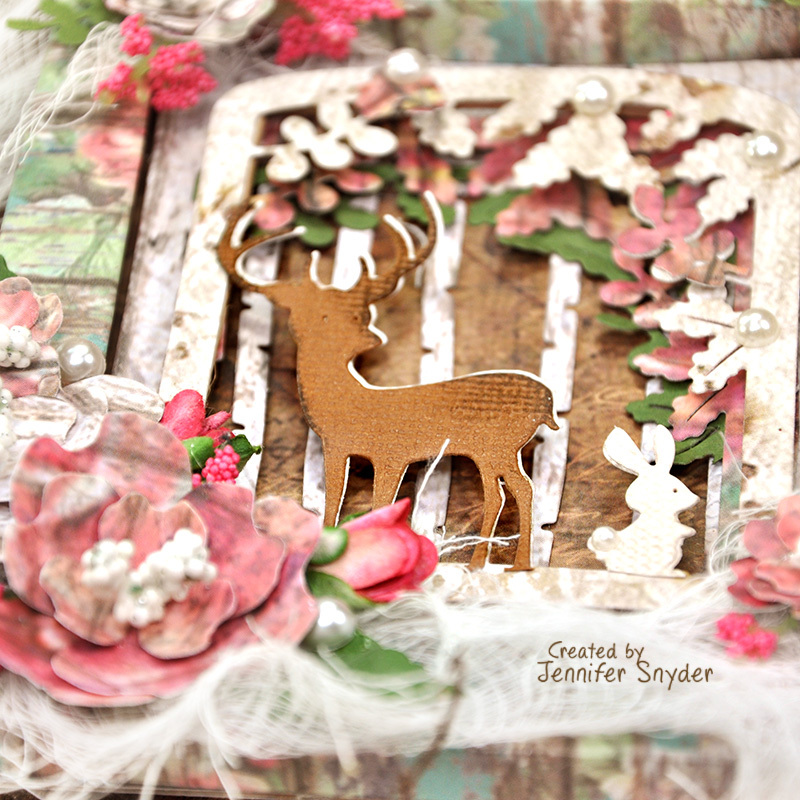 I have created two projects using the Shadowbox dies and embellishment collections by Becca Feeken. 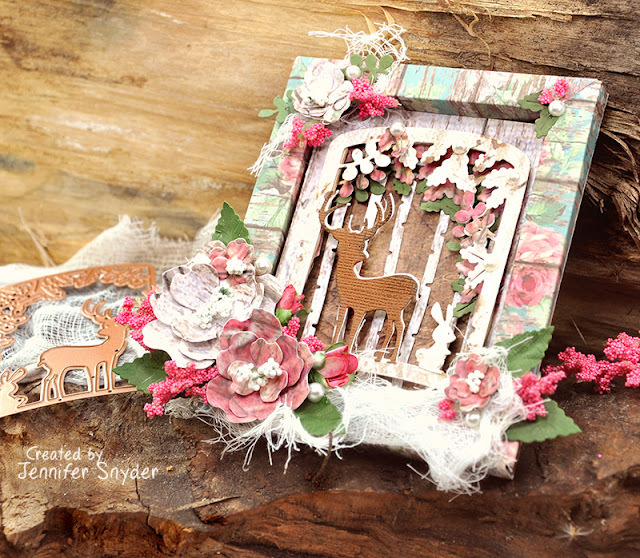 My projects feature Spellbinders Adjustable Shadowbox Frame 1/2 inch - Becca Feeken. If you scroll down, I added a link to Becca Feeken's video tutorial on YouTube. The coolest thing about these frames is that they are totally adjustable and can be made in any size you desire. Rich wonderful layers!!!! The paper I chose for this is Stamperia's Roses Lace & Wood 12x12 paper collection . Here is my second shadowbox. 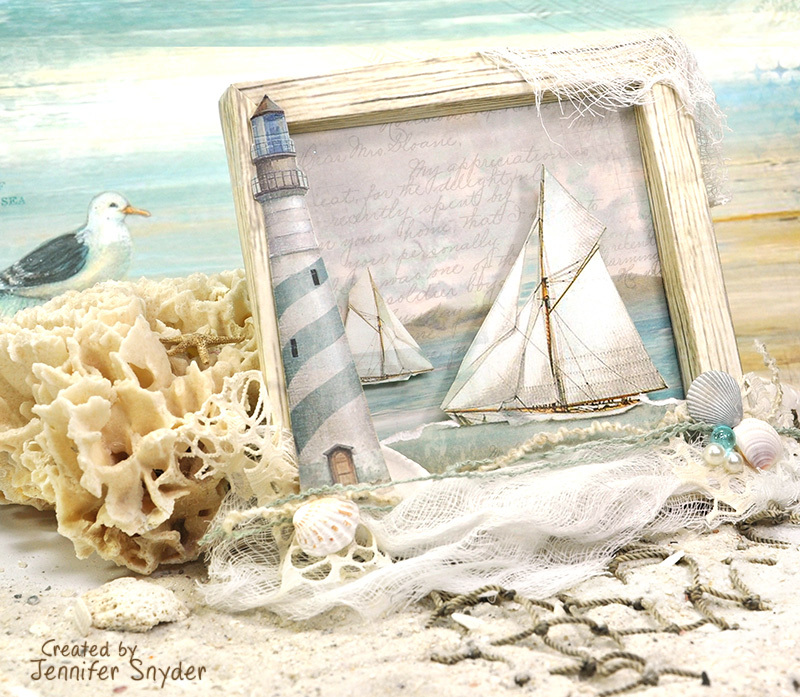 I love the ocean so I made a seascape using Stamperia's Sea Land paper collection and Spellbinders newly released Adjustable Shadowbox Frame 1/2inch - Becca Feeken. In order to make this frame, I cut 4 pieces of paper each 5 inches long. Square frames require all the papers to be cut the same length. 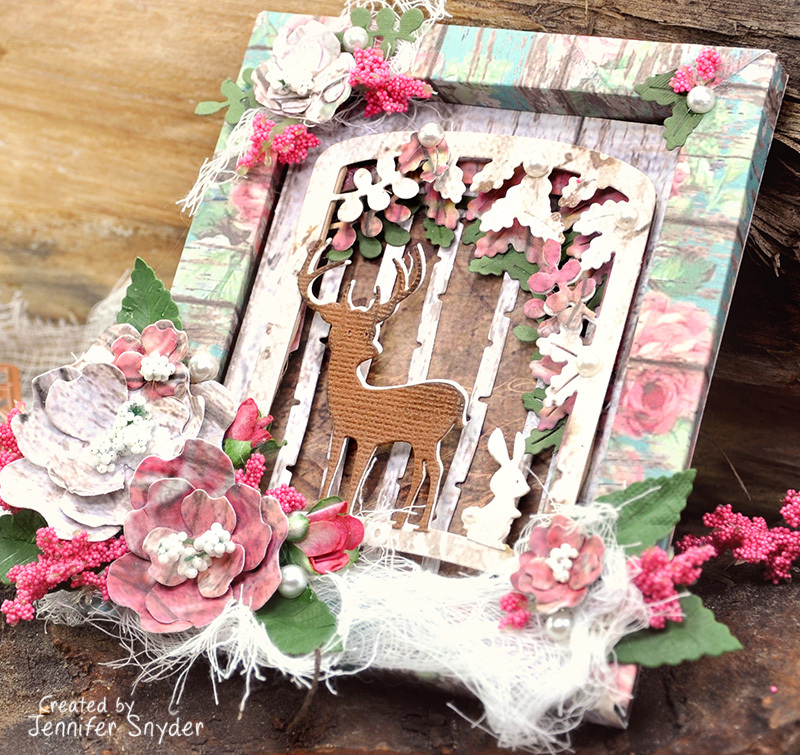 Here is a link to Becca Feeken's Shadowbox video tutorial. Let the beautiful, talented Becca show you just how easy these frames are to make and customize for any project. Link to shop for Spellbinders Adjustable Shadowbox Frame 1/2inch - Becca Feeken. Amazing designs. I really love the ocean scene. I really like what you have done with the new dies, so many wonderful ideas. OMG your work is stunning - I am WOWE#D by your nautical shadow box - I am so inspired!!!!! Wow! I love both boxes and they are so different. Super! These are so gorgeous. I am in love with your nautical scene. Fabulous! Fantastic shadowboxes! Both are amazing and I just love the sea themed one a lot! Well, I have to agree with TLady. You stole my heart with the designer papers and the seaside shadowbox. WOW! I love the flowers on the first shadowbox. Gorgeous projects! and fun and so pretty. The deer scene is SO WONDERFUL!!!!!!!!!!!!!!!!!!!!!!!!! 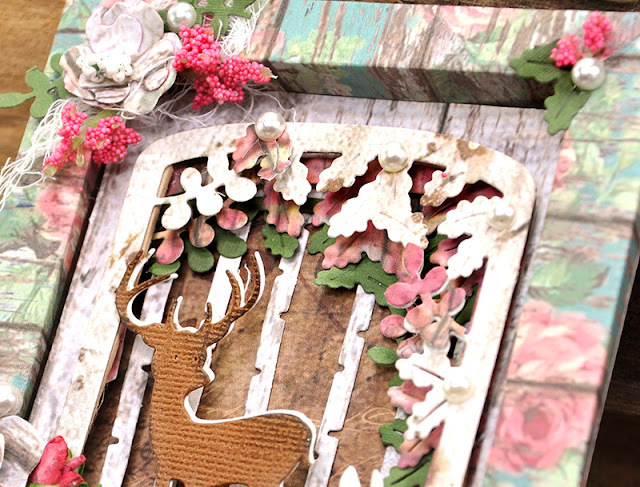 I love the way you integrated the frame and the woodland scene so it all goes together. I have to say, though, that I'm blown away by the lighthouse! I love the woods but the sea has my heart. Both of these are very lovely and well done. TFS! the scenes in the frames are fabulous. These are both fabulous pieces of home decor! I love the woodland scene and the wood look of your lovely seaside frame is amazing!! What a great release and hop! Love these beautiful shadow boxes! The patterned paper you used on the first one is so pretty. The second one is very detail oriented; good job! WOW! These are both so amazing; I love everything about them! They are both so well done; I am amazed! Thank you so much for sharing these. Very pretty. Love the papers on the shadowbox. Both shadowboxes are gorgeous! Love the many layers of the first one and the sweet scene. The seascape is lovely! What great projects. The woodland scene is enchanting. I live in coastal California with the beach a block away so your shadowbox of the ocean is a breath of home. Thank you, Jennifer! What BEAUTIFUL SCENES! I love the deer one with the florals! Both your pieces are beautiful! I especially love the ocean one. I was glad to see the use of patterned paper - I think we all have so much of that stuff and often no clue how to use it. Both are so beautiful but so different. I can't wait to make some shadow boxes. I LOVE your projects! Very pretty. I do love the beautiful soft colors of your floral frame and its woodland theme. The ocean one is quite wonderful. I'm falling in love with these frame dies, especially the adjustable one! Love the color palette and the deer. Beautiful I love the ocean paper. The seascape shadow box is amazing! Beautiful pieces - I love the texture on the shadowboxes and that sailing piece is gorgeous. So cute Jennifer!! I love your beautiful projects!! 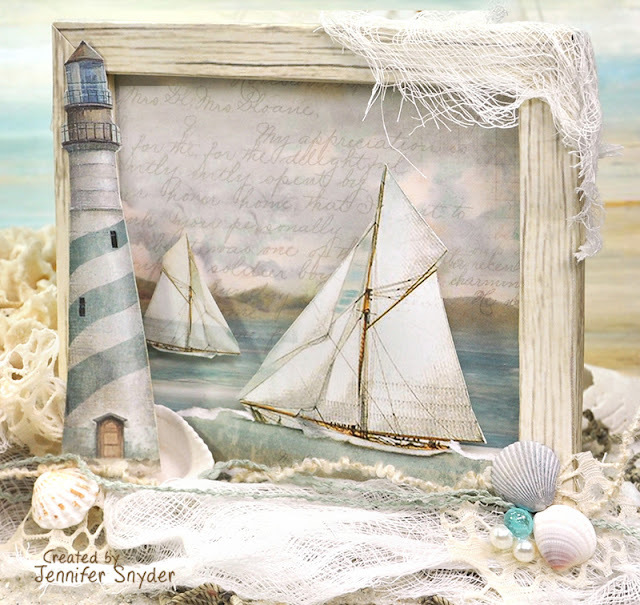 What a great lighthouse with sailboats card. My Brother would love it!!! I love the seascape box, it is just so beautiful, thank you for sharing with us. Nice. Love the nautical card. Very nice work. I love it all. Love your projects especially the ocean themed one. Living at the beach I'm a sucker for a ocean scene. Your work is just stunning. The elements pair so beautifully on these two projects and highlight the real versatility of these new dies. Thanks for sharing this inspiration with these fun products. Oh what amazing projects! Fantastic details, layers and textures - wow! The seascape is my favorite. Hello Jennifer. The shadowbox you shared using the Layered Thinking of You Woodland Scene dies was quite impressive. I loved the paper you used that made the scene blend into the card structure itself. The second scene you used of the lighthouse was great as well. Both were very welcome during this winter weather we've been having as they were bright and cheerful. Thanks for sharing your inspiration! Wow, your use of paper to blend into your design is fantastic and so creative! I love both projects! Well done. Really stiller pieces using these new shadowbox dies!! You blew me away with the Woodland scene but then the lighthouse was stunning as well!! You rocked this release!! Gorgeous shadowboxes! The lighthouse is just amazing. These are FABULOUS! I just love them. Both of these shadowboxes are wonderful. These dies have so many possibilities, including beautiful home decor. Wow! They are both beautiful. Love these gorgeous shadowbox frames! Lovely projects! Wow. Your layers are impressive! Fabulous projects, as always. BTW, I am happily your newest Instagram follower. These look fantastic! I absolutely love that seascape. Are the boats and lighthouse part of the patterned paper also? I love the 3d look it has. love your work! loving the layering dies! wow. loved the papers & colors used on the box. Then I saw the lighthouse and I loved it so much! I am really drawn to lighthouses, so now I want to make this project too! Ohmy goodness! Just amazing! So many gorgeous details! Your shadow box projects are amazing. The beached themed box is so soothing and the first one is son vintage chic. Both serve as great inspiration. Love the lighthouse/ship project the best. So inspiring... Love the lighthouse! OK ~ you had me clapping with happiness when I saw the 3D forest project shadow box and then literally my jaw DROPPED when I saw your boat scene!! WOW! I am so in love with these dies and all of the amazing ideas you all are sharing on this hop!!! Your paper choices and embellishments are gorgeous!! Beautiful, beautiful shadow boxes! You really have a flair! Thank you for sharing! Oh my gosh, your creations are stunning!